"But there will always be violins to play love songs"
The French Final was held on March 26th, hosted by Evelyne Leclercq. Before the final there were 2 semi-finals - click here for details: FRENCH SEMI-FINALS 1978 The winner was chosen by televoting. Joël Prévost previously took part in the 1977 French Semi-Finals. At the ESC he came 3rd. 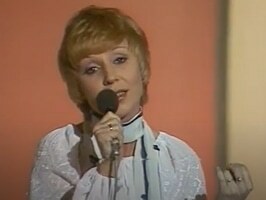 Noëlle Cordier represented France in ESC 1967.